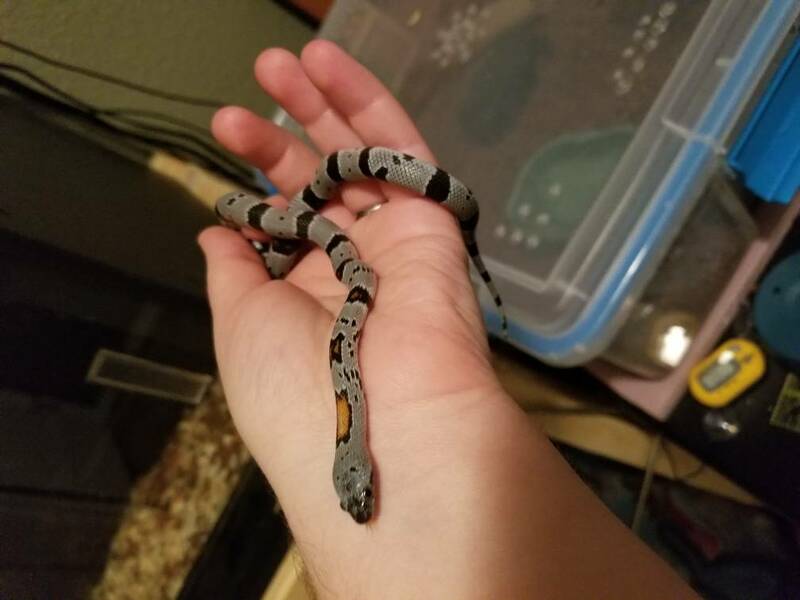 At this point, I would say I am notoriously bad at keeping up with progression threads, or even starting them for most of my snakes. So, in honor of the new year and to share some of my better pictures, I'll be posting pics of my various snakes. 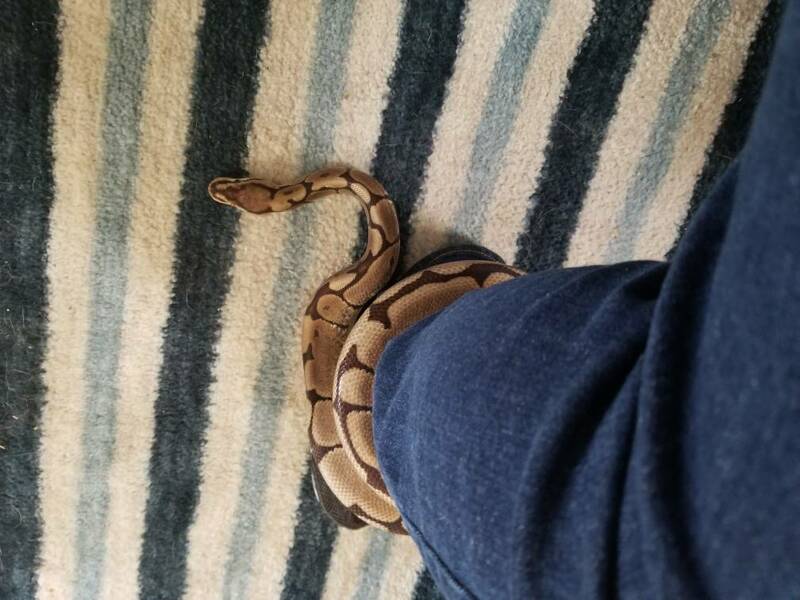 He only ever was super defensive in shed once, back when he was tiny, but he gave his all to a rattlesnake impression. Hissing, striking, lifted strike pose, and tail rattling.. the whole 9 yards. And my first ball python, Obi, a spider het for piebald. I was somewhat ignorant of some things, so I set out to get the nicest individual adult male I could find locally in my price range. I didn't have specific morphs in mind, since I was looking primarily for temperament. 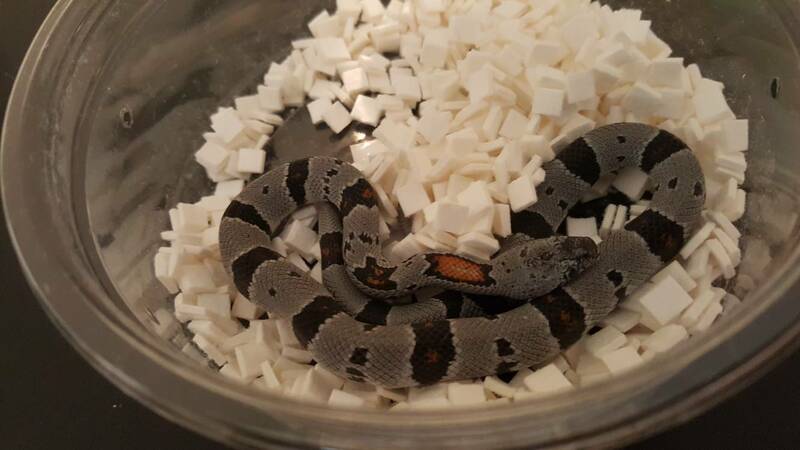 I had seen many posts on troublesome babies and eating and had wanted a smaller adult a sa start. Needless to say, those of you with experience know my problem... I got Obi in October just before winter and he had started his fast. He was a former breeder male and weighed about 1,350g to start. During his fasting he ate roughly 1 small meal per month, live only, for the first 5 months. 2 40-50g rats and 3 adult mice... needless to say, it was stressful trying to get him to settle. He is also a very good climber and seems to really enjoy climbing down as many things as possible. Tables, ladders, and even people. Last edited by pretends2bnormal; 01-03-2019 at 04:42 PM. I love Obi. Awesome markings. That Corn is a beauty. Did the camera not pick up the colors in the early photos or did they come in later? Compared to some I've seen, he is a pretty reduced pattern spider. I love the pattern on him. He was actually that dark as a baby (though my camera isn'tthe best either, haha). 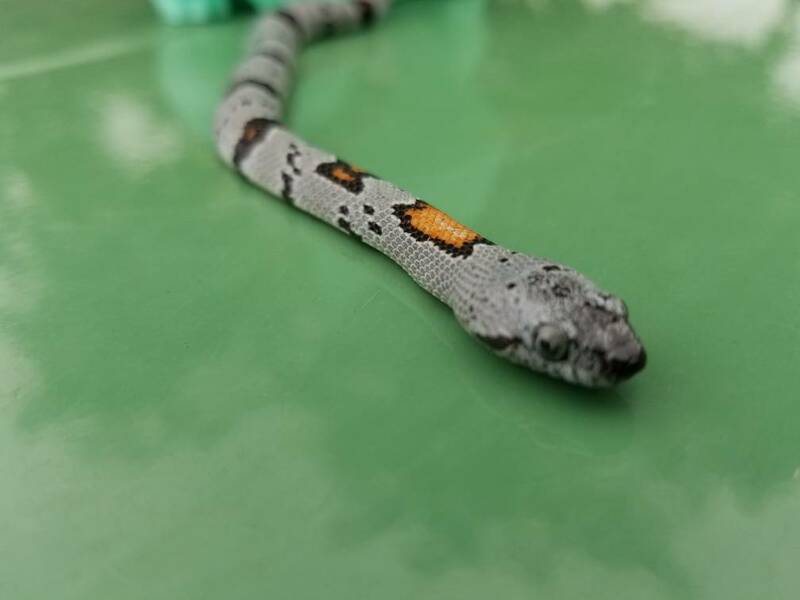 I think it is common in wild type corn snakes, as the dull colors are better camoflage. Corns typically get much brighter as they age. 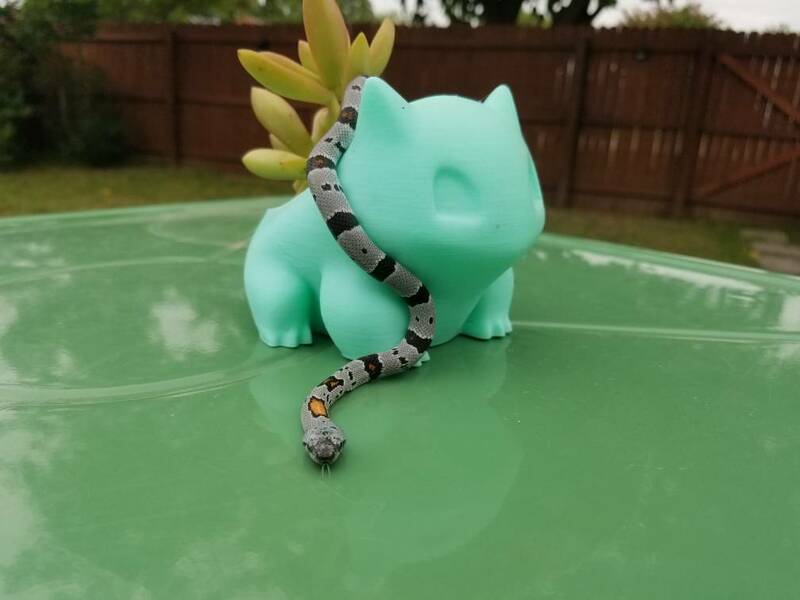 My next snake is a bit of a sad story. I haven't posted it before;by the time I thought of it, it was too late to get help. But for the sake of full disclosure and perhaps to explain why I am adamant about the timing with any new owner who has had a regurge of unidentifiable origin, here's Red's story. 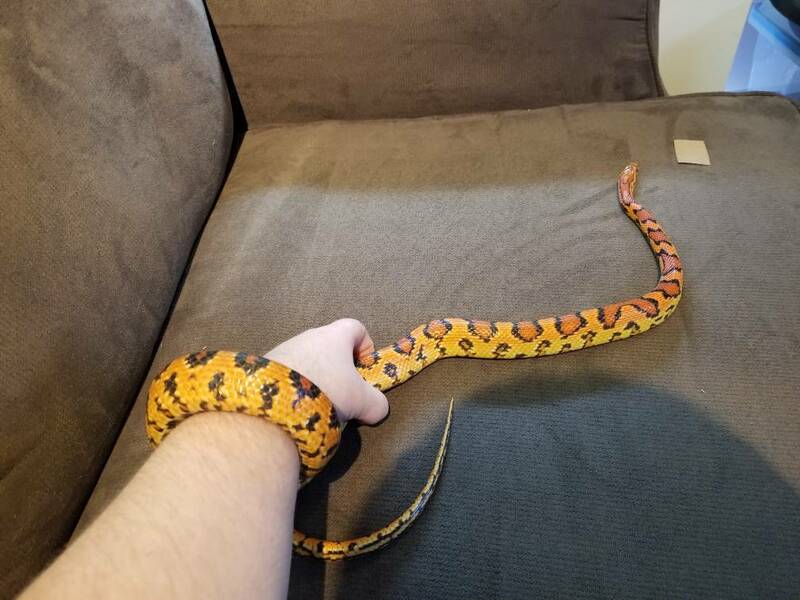 At the same time we bought Obi, my husband decided that he wanted a snake of his own (rather than "my" 2 snakes). 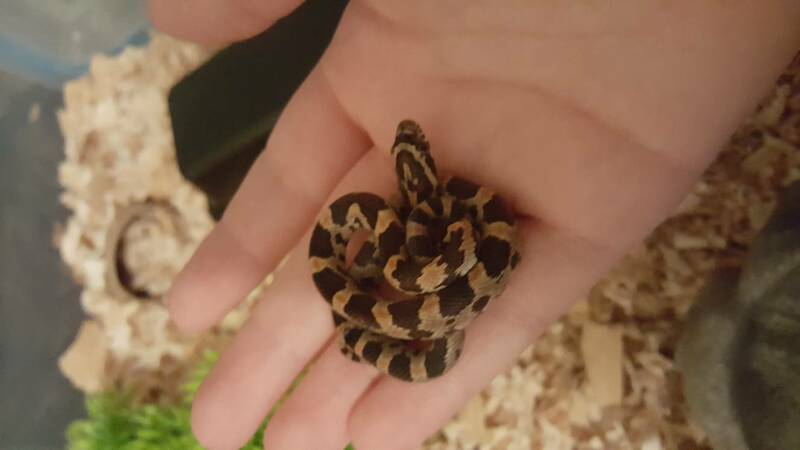 So, at that expo, we went back by the table of the breeder we got Noodle from. 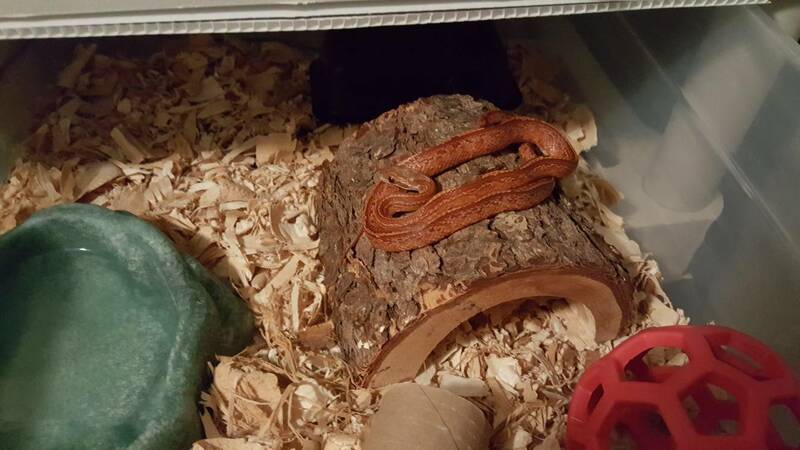 He decided he liked one of his corn snakes, a male blood red tessera that was promptly named Red. Red was bigger than Noodle, and at the time, I had thought it likely to be a yearling of a decent size. 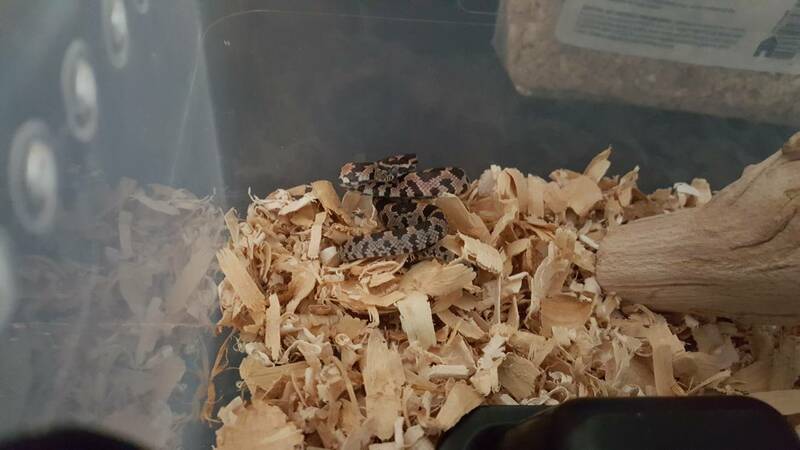 I didn't have much perspective of corn snake growth rates, nor did I find much online that would give any concrete numbers to judge off of. As far as we can tell, he must have been a yearling and a poor eater or an early-season baby that had quit eating regularly. 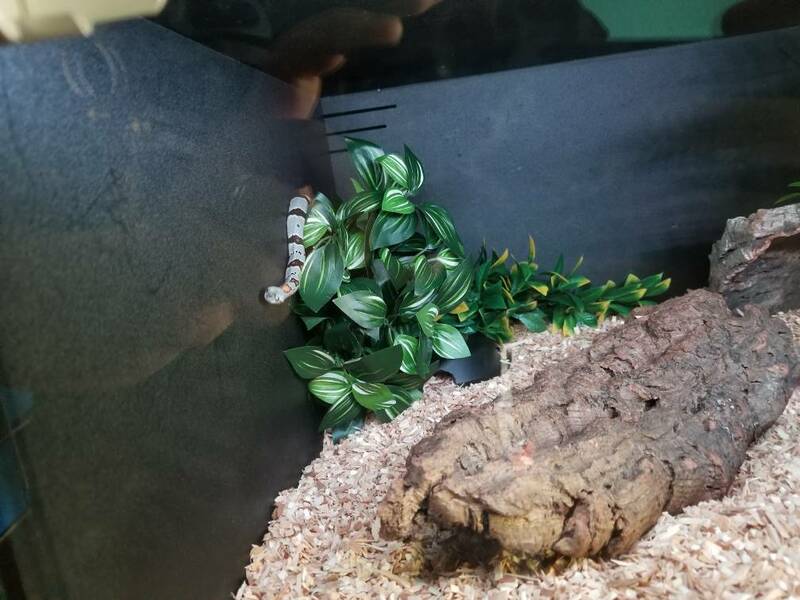 Looking back, I can say that he looked quite skinny for his length and much longer than a 5 or so month old corn snake should be for his weight. We got him home, waited a week for him to settle, and fed him. Meal 1 went okay, but a week later after meal 2 (each 1 large pinky about 2 to 3 grams), he regurgitated. Of course, we panicked a bit. I spent hours researching regurgitation and protocol for it. 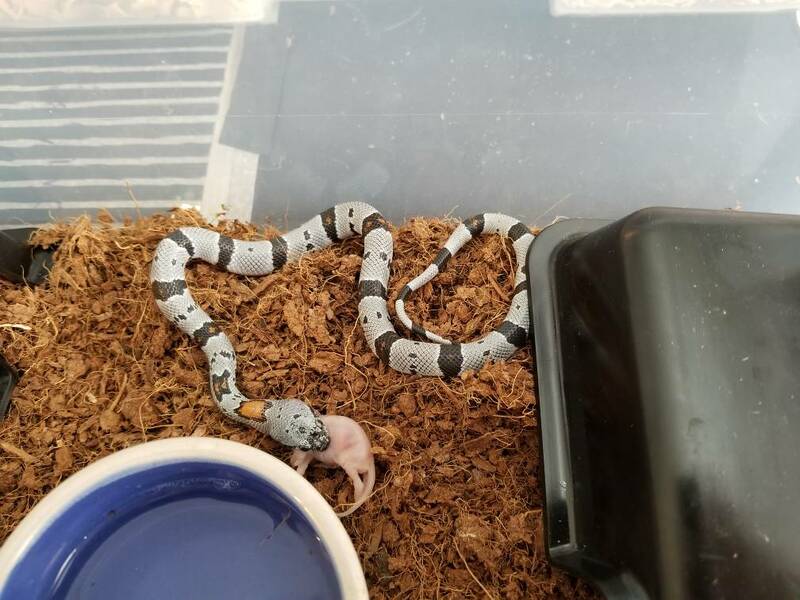 I found what was a highly respected corn snake breeder on the cornsnake forum saying what to do in a sticky (Kathy Love, if I remember correctly). It called for an 8 day break, no handling, and a smaller meal. We did that to a T and offered a 1g pinky (that may have been less since our scale barely read it as 1 gram). This one was also regurgitated. After that, we took him to a vet. 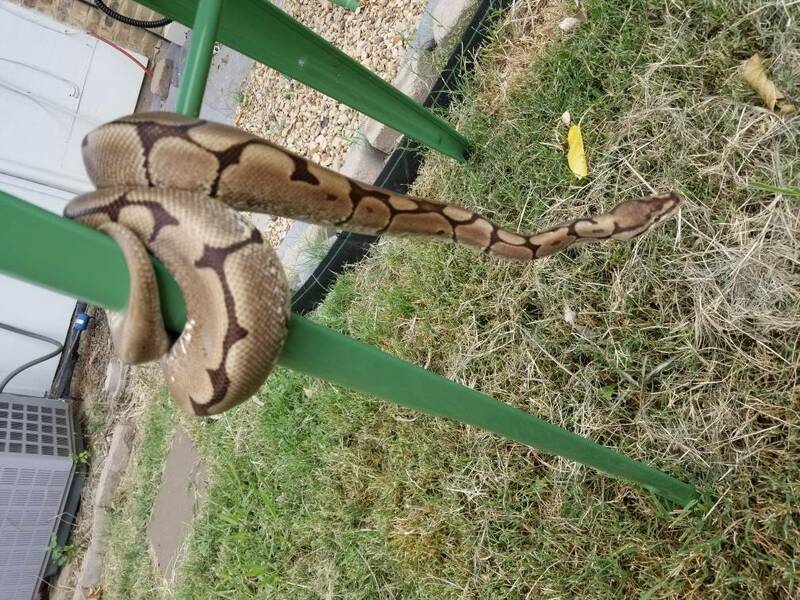 The vet is considered good for exotics and snakes and he actually bred corn snakes himself for years in the past, so we considered ourselves lucky; he clearly knew what he was talking about when we were there, how to easily handle the snake, etc. He gave us some meds to inject into the pinky as a precaution of any parasites and told us he was very skinny; my memory isn't the best, so I don't remember what ned it was. He said that the snake had probably been regurgitating meals or at least refusing meals for quite a while before we got him due to how skinny he was. By that vet visit, after about 3-4 weeks of owning him, he had lost 8 grams, down to 20 grams, and shed once during one of the waiting times. He did keep down the small pinky with medicine (injected into the mouse's belly) the vet gave us, but after the following meal, he regurged that one and we found him dead in his tub the following day before we could bring him back to the vet or call to get more information. Months after this, I found another set of pages about regurgitation that suggested waiting a minimum of 2 weeks to allow the throat time to heal and replenish stomach enzymes. To this day, I wonder if I had found that page sooner and waited longer to offer if he would have pulled through. We never did get around to calling the vet again after; it was too depressing. So, it was a bit of a surprise when they sent a birthday postcard to Red last month. 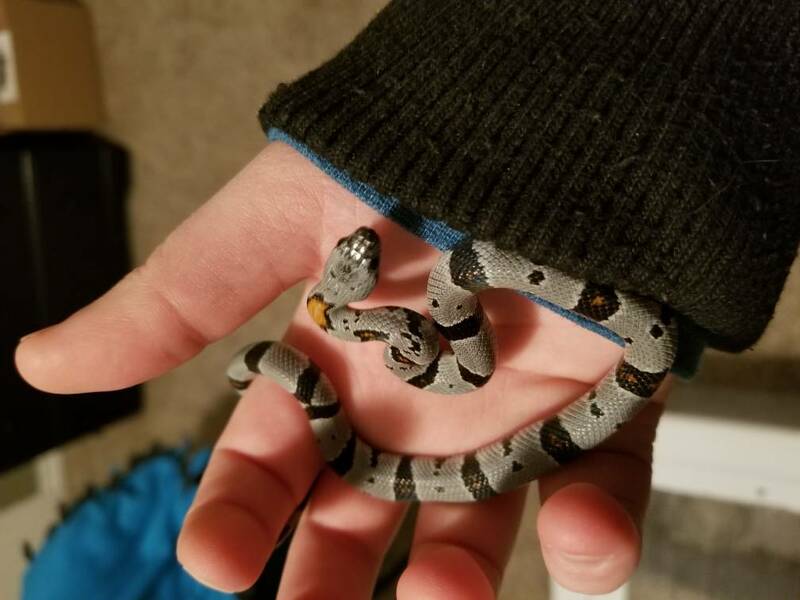 Oops..
Next up is Ash, my Texas Graybanded Kingsnake. He's considered an alterna phase, and as such has minimal orange. 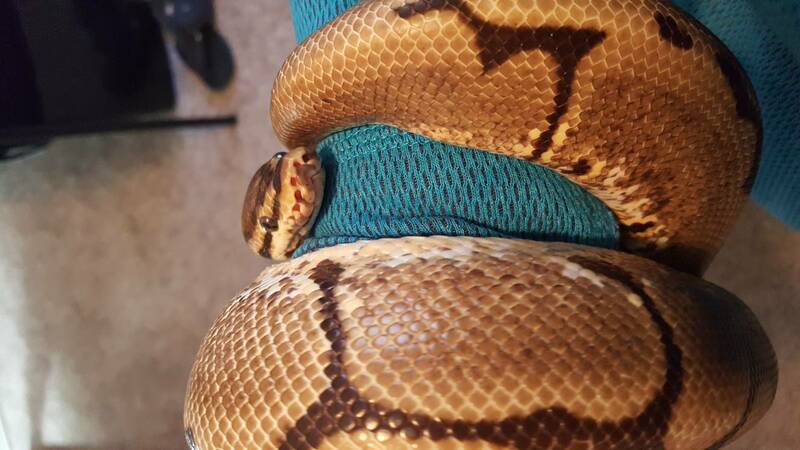 This guy managed to squeeze out of a ventilation hole that safely contained Noodle at 6 grams when he was 12 grams within 48 hours of a meal. 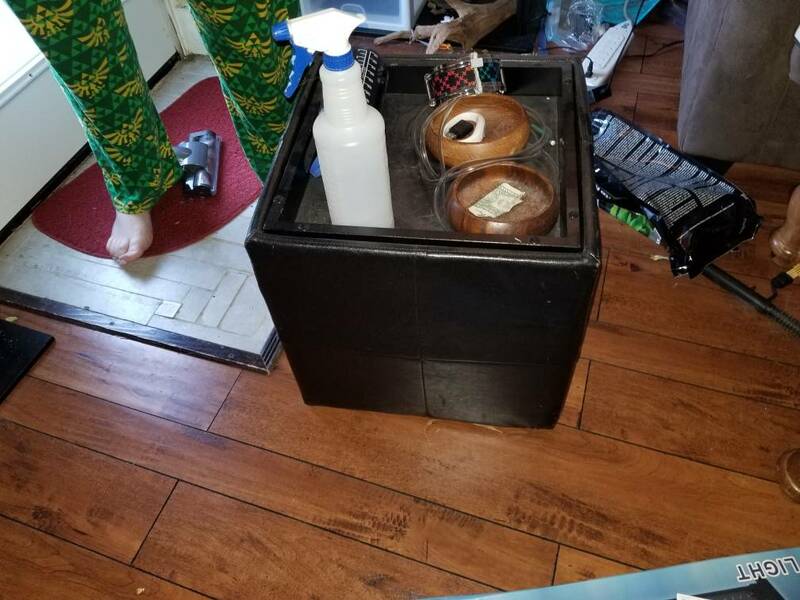 We triple-checked everything and that's the only possible way he could get out. He escaped about 1 month after we got him, last winter. And proceeded to make himself scarce for 4.5 months. 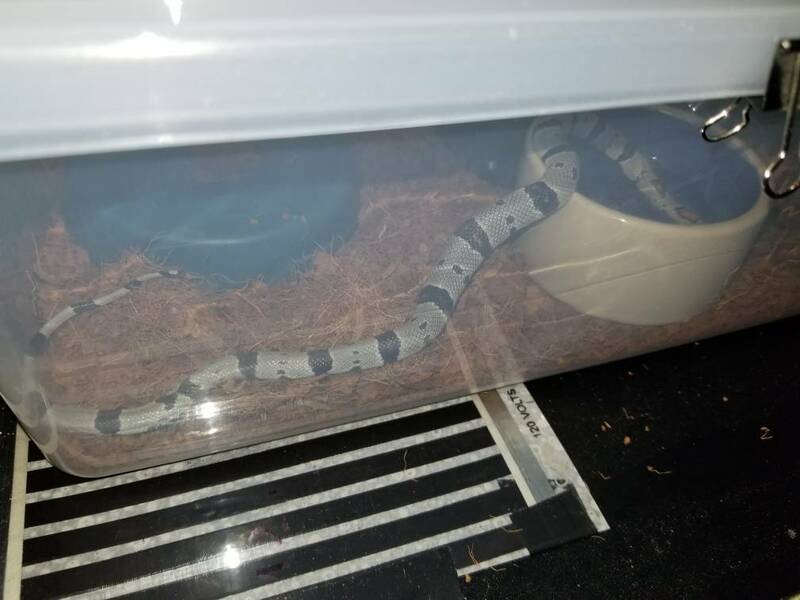 We were moving our snake room in May and while setting up the new space spotted a small shed... and found him under an automan 5 minutes later having only lost about 1 gram. He is now almost 60 grams at his last weight check, growing slow and steady.